This entry was posted on Tuesday, February 5th, 2008 at 7:31 pm and is filed under Art & Photography, Brooklyn, Subways & Other Transportation. You can follow any responses to this entry through the RSS 2.0 feed. You can leave a response, or trackback from your own site. 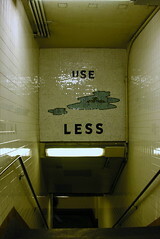 Use less had me in splits!!!!! how did you manage to find subways this empty??? Wow, very interesting and I agree with Moi, How come its so empty. I didn’t think subways were ever sans people. Great art work with a bit of humor. Thanks for letting me see Brooklyn. I may never get there and always wanted to. Gina from Memphis. 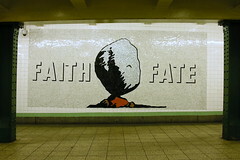 Oh the subway art! I’d forgotten about it! Used to love it. Trudging off for work, sleepy-headed, preparing for a blah commute — then oh! something intriguing has been installed in the station! — and for the weeks/months the installation’s there, you keep discovering something in it you didn’t see before. 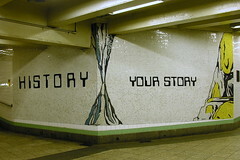 Love the subway art. I haven’t seen this before. I don’t get out to Brooklyn often but my friend just moved to Boerum Hill this month. I will definitely be visiting Brooklyn more often now. 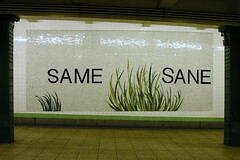 Does anyone know what the Same/Sane mosaic means? No one knows! My theory is: The Grass is always Greener on the otherside. Notice the less than green grass on one side. And you would be going insane pining to be on the other side when in fact it is not actually any better or worse. And you’d be sane knowing that fact and living life contently. Anyone have any insight?